A magnitude 6,9 earthquake today killed about 300 people in the mountainous Tibetan Plateau in southwest China and left more than 8 000 injured as houses, schools and offices collapsed. A series of quakes and aftershocks caused low, brick buildings in Qinghai Province’s ethnically Tibetan Yushu county to collapse, residents and state media said. Troops have been dispatched to the area, Business Day says. The epicenter of the first quake was located 235 miles (380 kilometers) south-southeast of Golmud, a large city in Qinghai, at a depth of six miles (10 kilometers), the USGS said. Ten minutes later, the area was hit by a magnitude 5.3 quake, which was followed after two minutes by a temblor measuring 5.2, according to the U.S. agency. Both the subsequent earthquakes were measured at a depth of 6 miles (10 kilometers). Another quake, measuring 5.8, was recorded at 9:25 a.m.
Xinhua cited officials at the China Earthquake Networks Center as saying at least 18 aftershocks have been reported and that more temblors exceeding magnitude 6 were likely to occur in the coming days, Updated News reports. The provincial government said in a statement that “many” buildings were destroyed. More than 85 percent of houses collapsed in the town of Jiegu near the epicenter, Xinhua reported, citing a local official. Students from a vocational school are buried in the rubble, the official said. 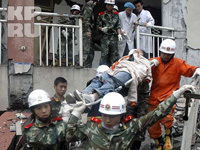 The government dispatched about 3,000 paramilitary police to the area to help relief efforts, state-broadcaster China Central Television said. Qinghai has a population of 5.57 million, the second-smallest of China’s provinces after neighboring Tibet. Golmud is located almost 2,000 kilometers west of Beijing, BusinessWeek informs.